Cute and delicious! 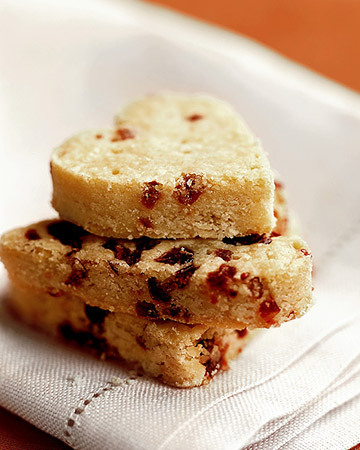 These little buttery, crispy cookies are a perfect little gift for your Valentine! Just wrap a bunch and tuck them into a cellophane bag and tie with a pretty ribbon for a home baked and thoughtful Valentine’s gift. Heat oven to 325 degrees.with a rack in center. Combine butter, confectioners’ sugar, vanilla, flour, and salt in a large mixing bowl. Beat with a wooden spoon until combined but not too creamy. Stir in dried cranberries. Pat dough evenly into an 8- or 9-inch-square baking pan. Bake until just beginning to turn golden, about 20 minutes. Place pan on cooling rack until cool enough to touch, about 20 minutes. Run knife around edges, remove shortbread, and transfer, right side up, to work surface. Use 1 1/2- to 2-inch heart cookie cutter to cut out cookies. Use a paring knife to trim stray bits of cranberry from edges. Cookies will keep for 5 days at room temperature in an airtight container. ← The Edward Gorey Watch ~ Gashlycrumb Fun!